Tianjin, a coastal city near Beijing which was one of China's 10 most polluted cities yesterday, has capped the number of car licence plates it will issue each year. The move follows similar pollution-curbing efforts in Shanghai, Beijing and other cities, Xinhua news agency said yesterday. 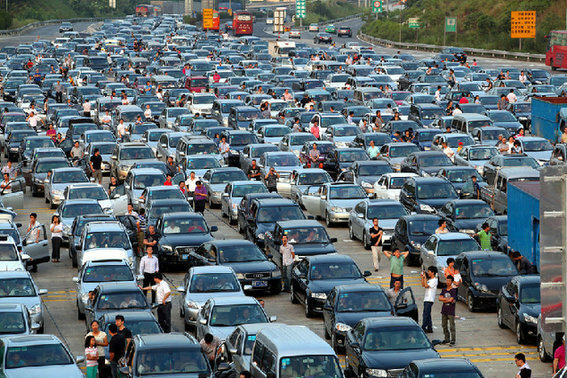 The world's most populous nation is also the world's largest car-buyer. But it is trying to rectify poor air quality and other environmental damage caused by rapid development. Tianjin, with 14 million people and 2.36 million registered vehicles last year, will cap new car plates at 100,000 a year. Shanghai, Beijing, Guiyang in the southwest and Guangzhou in the south have already imposed similar restrictions. Seven cities in Tianjin's neighboring Hebei Province joined it on the 10 most polluted list. The air quality index at the cities at the top of the list — Hebei's capital of Shijiazhuang and the northwestern city of Xi'an — surged above the ceiling reading of 500 in the morning, the People's Daily website reported. The central city of Wuhan made up the list. Smog is forecast to persist in central and eastern China until rain arrives on Wednesday.